Dhanteras is the day when Goddess Laxmi (Goddess of wealth) is welcomed into houses and workplaces. 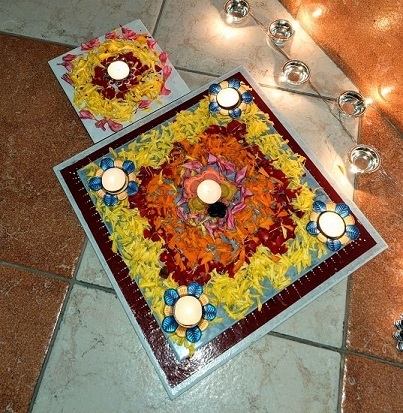 Every year, I do a floral Rangoli on Dhanteras and this year both my sons helped me out too. I was really proud to admit that my 5-year old’s creation looked much better than mine. The cutest Rangoli was done by my 2 year old on a small tile, while we gave him some flowers to play. He even made sure a Diya went on it to complete the look. As a ritual, we draw tiny footsteps of Goddess Laxmi at the doorway, coming into the house, to signify good luck. Both A’s school and P’s nursery had Diwali celebrations. The Nursery was beautifully decorated with Rangolis, lanterns and lights. 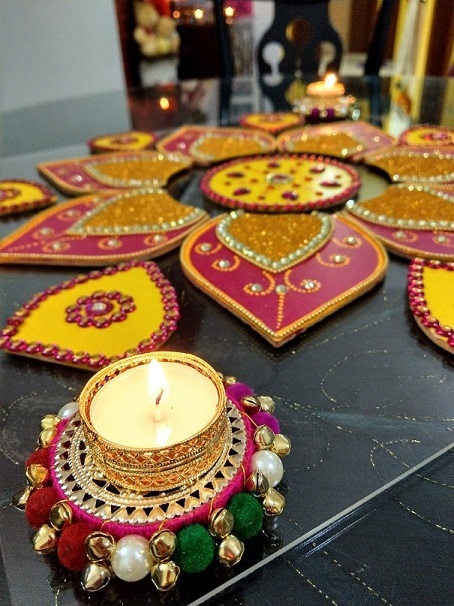 all the kids had to be dressed up in Ethnic wear and they even made diyas to bring home. 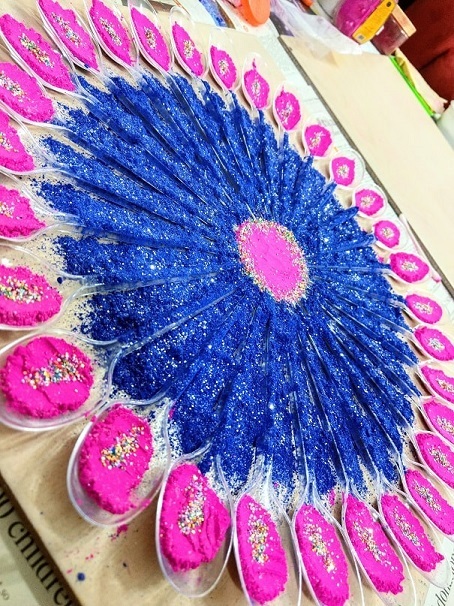 Once the kids were back home, we did another floral rangoli and this time A chose his design and did it all by himself. Every year, I try to make something sweet to offer during our Diwali prayers. This year, the kids helped me prepare some Chocolate Laddoos. I managed to sneak in some cottage cheese (paneer) and almond powder to make these treats yummy and healthy! The main day of Diwali is all about wearing good clothes, decorating and lighting up the house, performing prayers of Goddess Laxmi and eating lots of sweets. Since my husband has his own business, we go to his office to perform prayers in the afternoon and pray at home in the evening. The highlight of the day was a family dinner organised at my parents’ residence. I am blessed to have my maternal grandparents and uncles, aunts and cousins settled in Dubai and the presence of family makes every event 10 times more fun. We spent a fun evening, filled with love, laughter and light all around us. The outfit I wore here, was designed by myself. This was a quiet day spent at home, as the kids were not feeling too well (given the hectic last few days we had, you cant blame them for catching a nasty bug), and we just had their cousin sister and brother come over, as is our Saturday afternoon ritual. We had a memorable Diwali in 2017 and hope that these lights and colors continue to brighten up our lives for the rest of the year, too! How do you celebrate Diwali or any other special festival? Follow me on Instagram and Facebook, or sign up for the newsletter below, to keep up with the special events in our lives. Enjoyed reading about your Diwali celebrations.